There’s always something new and exciting to experience around the holidays in Indianapolis. If you’re looking for the best holiday activities, check out a few of the following options. Marvel at the beauty as Monument Circle transforms into a holiday wonderland during the Circle of Lights. Festivities start at 6 p.m. with live entertainment and a chance to take a picture with Santa. Stroll along Monument Circle and view the 52 giant toy soldiers and peppermint sticks that surround the Soldiers and Sailors Monument. 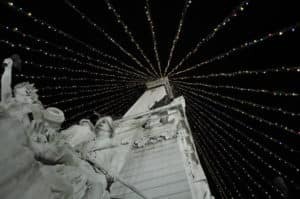 The event culminates at around 7:50 p.m. with the flip of a switch to light the 60,000 twinkling lights in the trees and the 4,784 colored lights and 52 garland strands on the Soldiers and Sailors Monument. Festivities at Christmas at the Zoo run from 5 p.m. to 9 p.m. on select days. You can see Santa in White River Gardens and take in the beautiful holiday lights that decorate the zoo. The cafés and food stands around the zoo will serve special holiday treats, including cookies and hot chocolate. There are special photo opportunities throughout the zoo, and rides like the White River Junction Train and carousel are open. While you’re walking around and taking in all the holiday sights, make sure you keep an eye open for the 10 mistletoes hidden around the zoo. Find at least five and you can enter to win a prize at the gift shop. Come to the Jingle Rails exhibit at the Eiteljorg Museum and view nine trains as they travel over 1,200 feet of track. The trains go through miniature scenes of downtown Indianapolis, including Lucas Oil Stadium, where you’ll hear Colts announcer Bob Lamey call a game, Soldiers and Sailors Monument, and the Indiana State Fairgrounds. The trains then travel on to other national wonders, such as Mount Rushmore, an erupting Old Faithful geyser, Las Vegas, the Grand Canyon, and more. While the Children’s Museum Indianapolis is fun any time of year, it’s truly magical during the holidays. During Jolly Days Winter Wonderland, your children can take a trip down the two-story Yule Slide and explore the Ice Castle. They can go pretend ice fishing and ice skating in their socks without worrying about cold noses and fingers. They can also head into the giant snow globe to make it snow, and use the pretend kitchen to bake winter treats. When you’re looking for some fun things to do in Indianapolis during the holidays, join your friends and family for the previous festive events and activities.